AJ Bell Investment Director Russ Mould shares some analysis in light of the U.S. payrolls data coming in under estimates. The lower-than-expected US non-farm payrolls figure rounds out a mixed week of jobs data from America, but the big upward revision to November and a 2.9% increase in average hourly wages are going to be enough let markets keep their faith in the Trump reflation trade and the US Federal Reserve plan further interest rate increases. Mould adds that the increase in wage inflation, the upward revision of November's non-farm payroll and the lowest quarterly reading of U.S. job cuts indicate the economy is tickling along nicely. This supports the prevailing market narrative that an acceleration in growth and inflation is coming, to the potential benefit of stocks (and cyclical, turnaround and value plays in particular) and to the detriment of both Government bonds and also expensive defensive, quality growth equities. Christophe Barraud, chief economist and strategist at Market Securities, says the latest U.S. payrolls data is encouraging, despite the headline figure coming in under expectations. All in all, numbers are sufficient to sustain optimism for a GDP close to 3.0% (QoQ Annualized) in Q4 and confirmed that labor slack diminished. The report will comfort policy makers in their belief that wage pressures are materializing and that full-employment is close. Once again, it will fuel expectations for a tightening monetary policy in 2017 in line with Fed’s dots (3 rate hikes). Note that we remain a bit more conservative as we expect only two hikes this year. U.S. markers are now open, moving to the upside but otherwise flat. JUST IN: Rosalind Brewer, the president & CEO of Wal-Mart's Sam's Club unit, will retire next month; John Furner will replace Brewer. 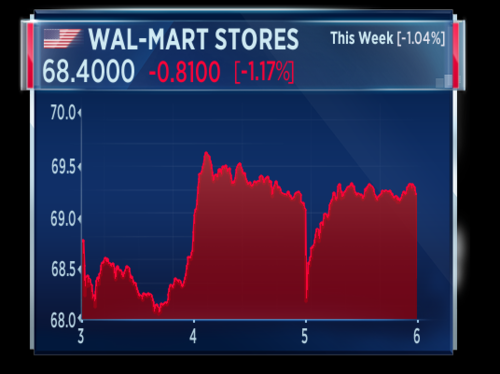 Wal-Mart shares are down following news that Rosalind Brewer, head of the Sam's Club unit, will retire soon. 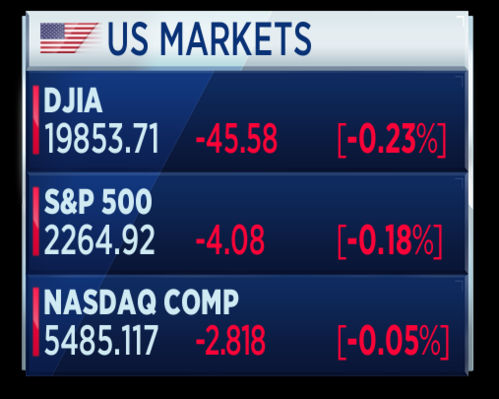 U.S. markets turn red, with the Dow slipping 0.2 percent lower. 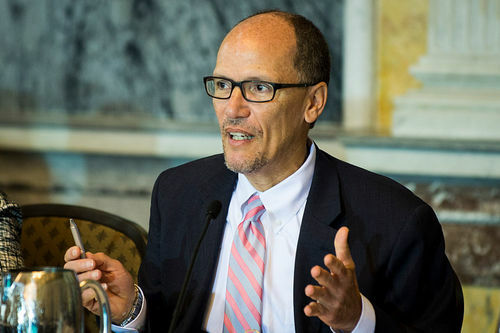 Secretary of Labor Thomas Perez is speaking live on CNBC. He is saying that evidence shows Obamacare and minimum wage rises have not been job killers. He says Americans deserve a wage rise. More people buy hamburgers when they've got money in their pocket. Perez is playing down concerns about automation, robotics and AI taking away jobs, pointing out that self-driving cars will need somebody to fix them. Perez is now talking about the importance of investing in people and providing apprenticeships, in order to train up the human capital to adjust to coming changes to the economy. 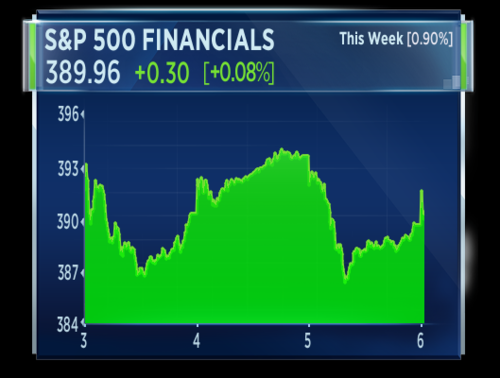 The financial sector of the S&P is the only sector in the green today. For the week, the sector is up almost 1 percent. 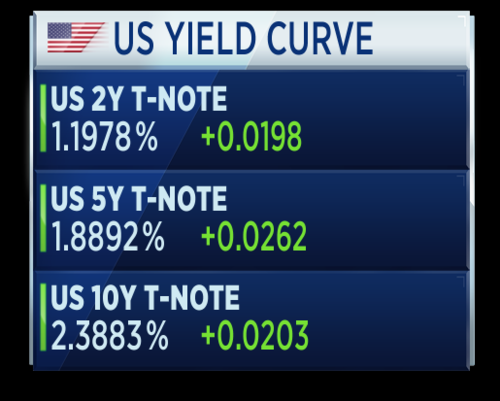 Yields on U.S. bonds are trimming gains right now. The U-turn is the result of investors digesting the wage inflation reported in today's payroll data, which showed average hourly wages grew 2.9 percent year-on-year in December. The latest payrolls data, which shows wages rising and slack diminishing in the U.S. economy, provides support to the Federal Reserves plans for three interest rate hikes in 2017. Russ Mould, investment director at AJ Bell, shares his views on how President-elect Trump could influence the Federal Reserve's decisions this year. The composition of the Federal Reserve Board of Governors is due to change this year, with President Trump able to make two nominations, while in 2018 he gets to choose both the President and Vice-President. Given his vehement past criticism of record-low interest rates it remains to be seen whether his thinking, and his appointments, influences Fed decision-making this year and whether the US central bank moves faster than the markets expect when it comes to normalising monetary policy. November's durable orders were revised to -4.5 percent from -4.6 percent. Factory orders in November, excluding transportation, was up 0.1 percent versus 0.8 percent in October. 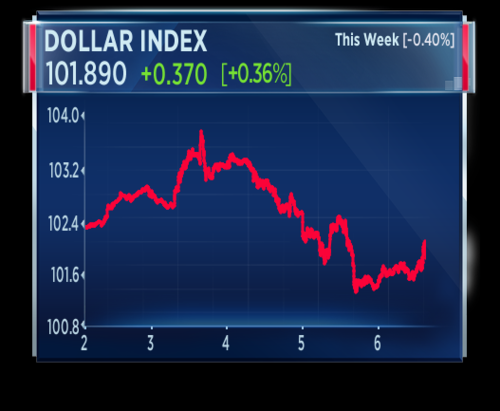 The dollar index is growing stronger today, up 0.3 percent. This is because of the strong wage growth figures in the nonfarm payrolls data. However, the index looks set to end the week lower. 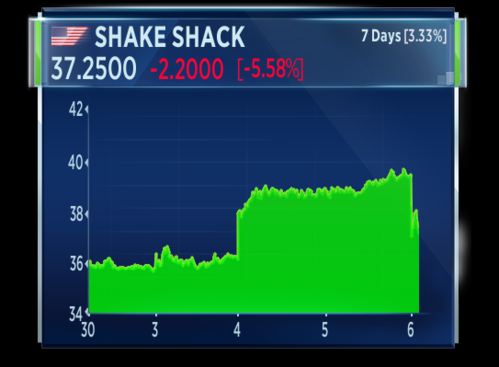 Shares in Shake Shack are down more than 5 percent today. 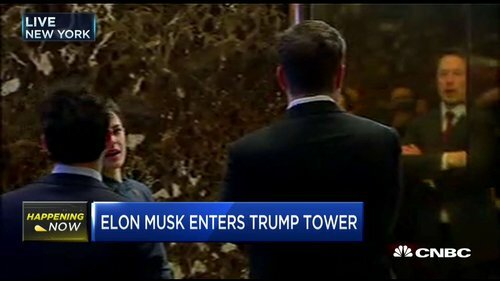 The shares were down around 2 percent in pre-market trade on news the current CFO will be retiring. This chart shows how the company's share price has performed over the past 7 days. Raghuram Rajan, former governor of the Reserve Bank of India, is live on Squawk on the Street, discussing the global economy. In large countries we have been a little slow dealing with the consequences of trade on real people. Rajan says there needs to be more help to retrain people or help people move to where jobs are. 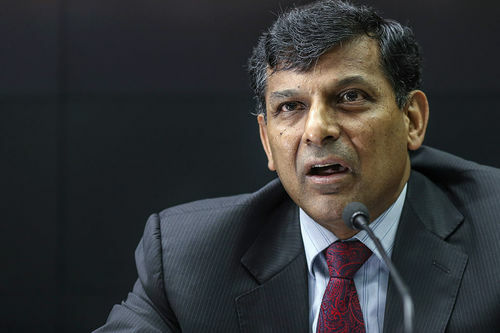 Rajan says the U.S. is the first "out of the trench" in terms of monetary policy as the Federal Reserve is raising interest rates, which boosts the dollar. He adds that placing tariffs on imports will also serve to make the dollar stronger, and eventually a strong dollar could be destabilising. Rajan is now discussing monetary versus fiscal stimulus. He says it would have been better for fiscal stimulus to come in a few years ago. Rajan says globalisation is the one of the main solutions to climate change and ageing demographics. Joanna Davies, senior economist at fathom Consulting, says the Bank of Japan's negative interest rate policy has backfired and should be abandoned. Investors punished Japanese equities and the yen appreciated, undermining the Bank of Japan's 2% inflation target and knocking consumer confidence. In November, the BoJ got a lucky break as markets anticipated a more rapid tightening from the US Fed, and the yen fell back. But relying on lucky breaks is not a sustainable strategy - Abenomics must change radically or be abandoned. 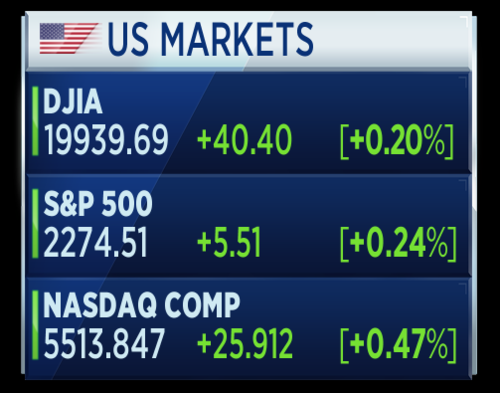 It's been over an hour since the U.S. market open and the Nasdaq is making modest gains, up around 0.2 percent. 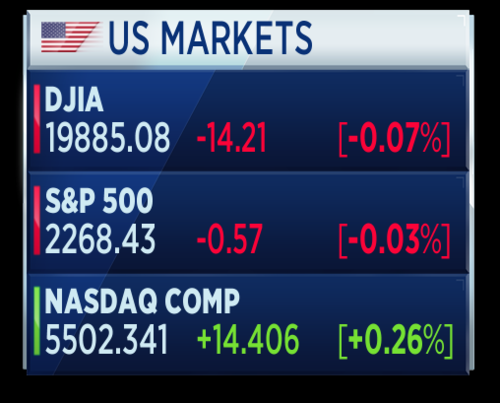 The S&P and Dow remain broadly flat. 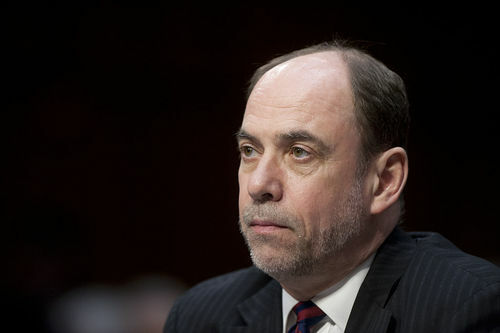 Douglas Holtz-Eakin, former CBO director, is live discussing the jobs report. He says social security benefits including the affordable care act mean many people can remain out of work. He says tax reform and capital investment will boost productivity quickly. Boeing has released data on its delivery numbers. The deliveries hit targets but orders fell short. The aircraft manufacturer reports 748 Jetliner deliveries and 668 net orders. As well, it reports it now has 82 customers for the 737 Max Jetliner. 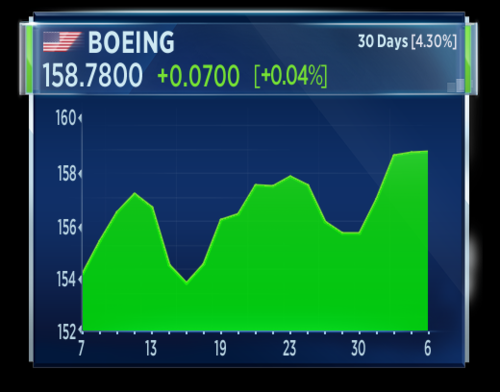 Shares in Boeing are flat on the news. Here's how shares have moved over the past 30 days. 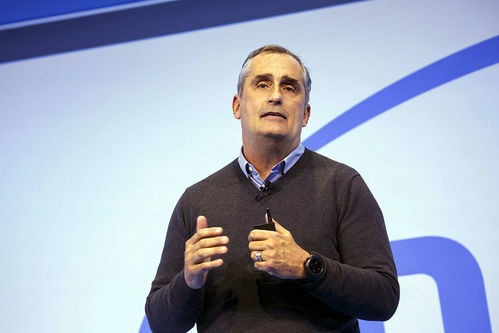 Brian Krzanich, CEO of Intel, is live on CNBC discussing technology trends. He's showcasing the company's VR headset, which does not require the user to be tethered to a computer and can use objects in your room as part of a game. Brian Krzanich says China is an important export market for the company. He says he wants to see the Trump administration avoid a trade war with China or place restrictions on trade. 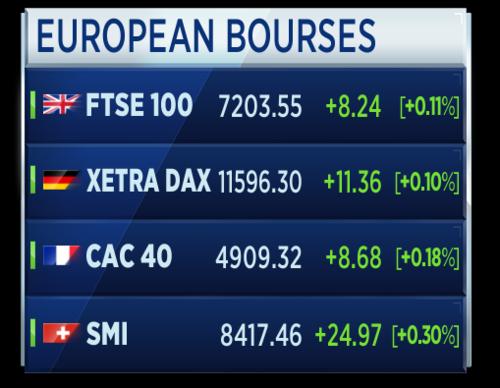 European markets are closed. 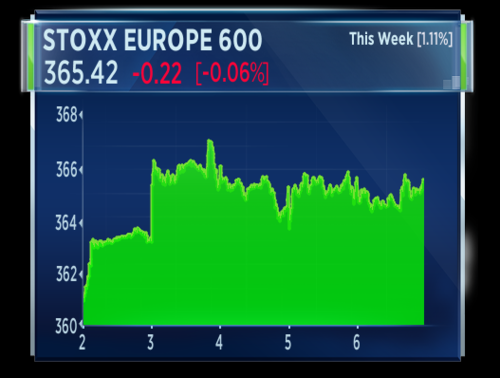 The Stoxx 600 finished the session down 6 basis points. 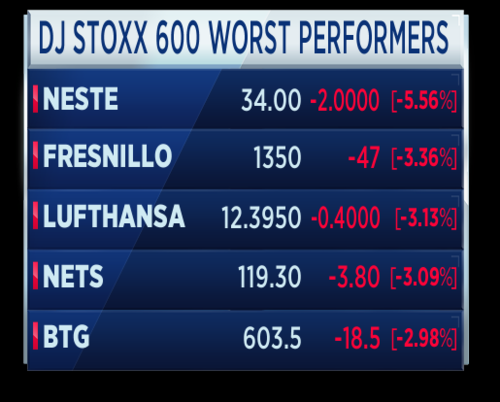 These were the best and worst performers in the Stoxx 600 today. 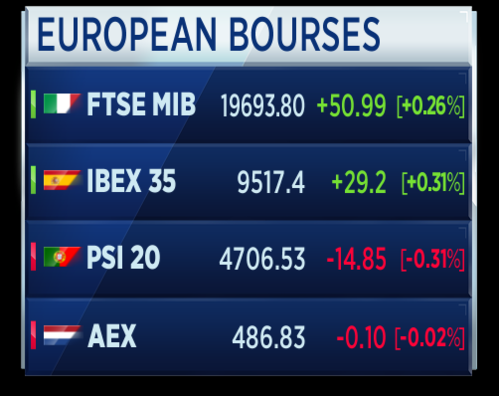 Here's how the individual European markets finished today's session. 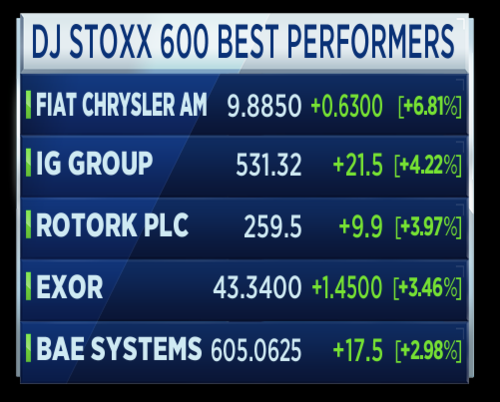 At the end of the first week of 2017, here's how the Stoxx 600 played out. 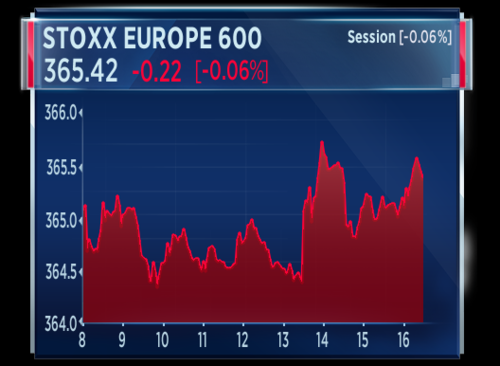 The European index finished the week up around 1 percent. 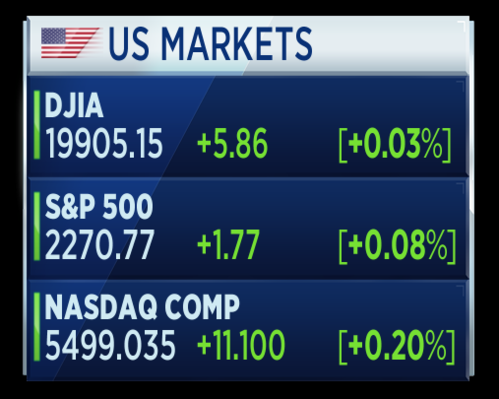 A last look at U.S. markets, where there has been a turn-around and stocks are moving into positive territory. The Dow and S&P are up around 0.2 percent. We'll close the blog there, thanks for reading and enjoy your weekend!